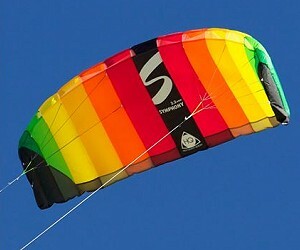 If you're interested in power and speed, this type of Two-Line Steerable Stunt Kite delivers. These Ram-Air aerofoil Power Kites are real muscle testers. Great for a fun workout when the wind picks up. 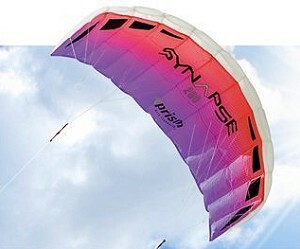 Soft, Ram-Air, Rip-Stop Nylon, steerable airfoil kites. 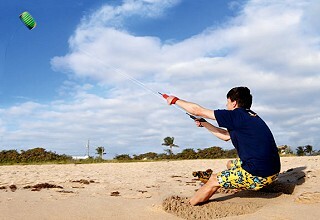 All sizes of kites complete with Flying Lines, Flight Straps and Carry-case. HQ Kites. Completely soft, Ram-Air, Rip-Stop Nylon, steerable airfoil. 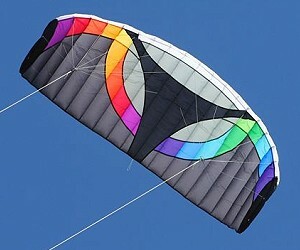 All sizes of kites complete with Flying Lines and Flight Straps. Prism Kites. 84" wingspan Rip-Stop Nylon, steerable airfoil with solid pulling power. Carry-case, Flying Lines & Padded Flight Straps included. Into The Wind.